On the evening of Friday December 10th a small, but dedicated and very international, group of listeners gathered on a windy and wettish marketplace to hear Boudewijn Zwart perform on the carillon, way up in the bell tower of the Maastricht town hall. 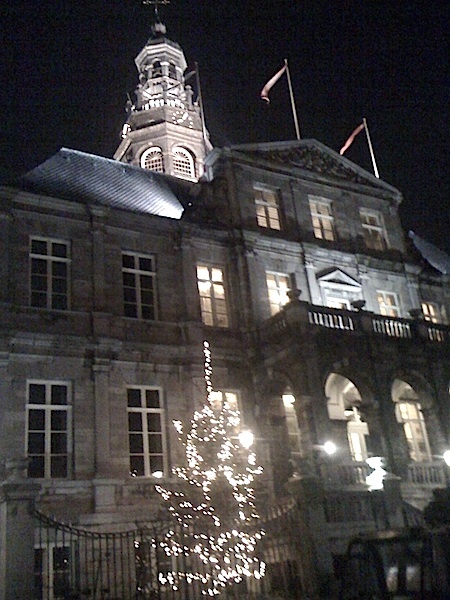 The carillon music mingled with the sound of traffic, the chatter and footsteps of passers-by, and the hammering and shouting of a group of workers who, under the cover of the evening’s dark, were setting up a gigantic stage in front of the town hall, for the next day’s recording of a musical holiday season entertainment program for Dutch national television, Kerststerren (Christmas stars). It was this mix of the crystal clear tingling sound of the carillon’s bells and the rumble and rattle of a city that continues to go about its business, that for me accounted for much of the magic of the event. Here is a (slightly edited) recording of the first piece that Boudewijn Zwart played that evening (John Cage’s In A Landscape), as it could be heard on the town hall’s front side. Most of the audience listened to Boudewijn’s performance on the other side, where there was less wind and where the space between the town hall’s backside and the buildings on the other side of the street acted as resonating body for the carillon sounds. Boudewijn Zwart’s concert marked the opening of Intro in situ’s presentation of the Resonance network in Maastricht, which continued that same Friday evening with the unveiling by Jacques Costongs, Maastricht’s alderman for culture, of the two sound installations that, until January 30th, 2011, can be visited and experienced in Intro’s workspace in the Capucijnengang: Pierre Berthet’s Extended Drops and Esther Venrooy’s A Shadow of a Wall. For the occasion the European Resonance partners, associated partners and artists had come to Maastricht. 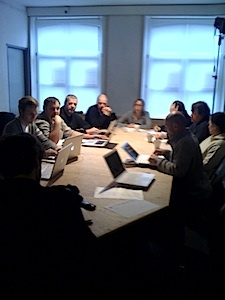 They met the morning after the opening to discuss the network’s plans and the program of residencies for the months to come. Maia Urstad, a new Resonance artist from Bergen (Norway), gave an overview of her work and presented several examples, like Sound Barrier (2006). And Paul Devens presented plans for his Resonance contribution to the upcoming Festival van Vlaanderen in Kortrijk (Belgium), which will be part of his project City Chase. In each installment of City Chase, Paul will create a dynamic and moving sound map of a city, using field recordings made while cycling through its most characteristic areas. In the afternoon the meeting continued at the Bureau Europa, with a visit to Paul Devens’ Panels installation under the Wiebengahal’s low semicircular concrete shell roof, and a discussion with Saturday’s special guest, the German composer and sound artist Peter Kiefer. Peter Kiefer will visit Maastricht again in January. As part of the finissage of near to two months of Resonance in Maastricht, on Sunday afternoon January 30th, he will talk about his recent book Klangräume der Kunst (Sound spaces of art) in bookshop Selexyz, in the Dominicanenkerk. Kiefer’s book – which many will regret to learn is available only in German at the moment – collects a great number of original articles that exhaustively investigate the notions and aspects of space, central to a lot of works that relate the visual arts with sound and music. Two other events will mark the presence of Resonance in Maastricht over the coming weeks. On Wednesday December 22nd, Pierre Berthet will perform at Intro in situ in the midst of his Extended Drops installation. Also at Intro in situ, on Tuesday january 18th, during a special Café in situ evening, I will talk with Esther Venrooy and Pierre Berthet about their installations, about sound, about art, about time, space, music and… about magic! Esther Vernooy’s and Pierre Berthet’s Resonance installations can be visited at Intro In Situ (Capucijnengang 12, Maastricht) from December 11th, 2010, until January 30th, 2011. Opening hours: Wednesday till Sunday, between 12h and 17h. Entry: €3,-. Intro in situ is closed on Christmas days and New Year’s day. December 22nd, 2010 – Performance by Pierre Berthet. Intro in situ. 20h30. Entry: €3,-. 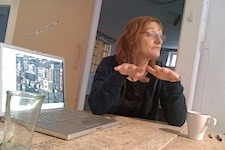 January 18th, 2011 – Café in situ: Harold Schellinx talks with Esther Venrooy and Pierre Berthet. Intro in situ. 20h30. 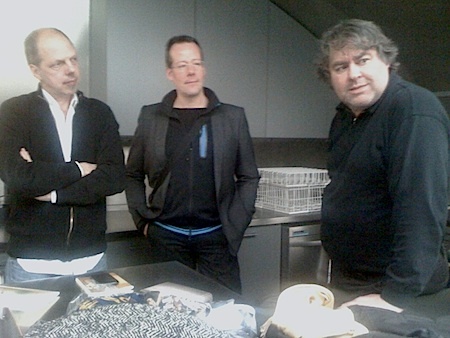 January 30th, 2011 – Peter Kiefer talks about his book ‘Sound spaces of art’. Bookshop Selexyz, Dominicanenkerk, Maastricht. 13h30. You are currently reading Magical Maastricht at Resonance - European sound art network.